River levels in southern B.C. are low, and their temperatures are warmer than normal. Fish are seeking shelter in deeper, larger, cooler pools wherever they can. With fish pooled in creeks and rivers, disease spreads more readily, and predators have an easier time making their catches of the day. Returning salmon, of course, can’t choose to spend their final months hiding out in cool pools. Their biology drives them to reach their gravel beds of origin in time to spawn. While they may rest in deeper pools en route, the imperative sends them away from shelter into whatever channels contain enough water to allow them to fight their way upstream, no matter the water’s temperature. Warm water causes fish to use more energy and tire faster. Warm temperatures can change freshwater chemistry, affecting the amount of oxygen dissolved in the water and available to fish and other critters. 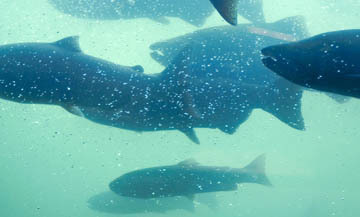 This year, by the time they reach their spawning grounds—if they reach their spawning grounds at all—the usual half-rotted living salmon may also be ever so slightly cooked. This summer and fall is going to be an extra-stressful, fishy time. In a way, this year’s warmer rivers replicate old-timey laboratory research on a widespread, natural scale. Experiments done in the mid-19th Century suggested that if you drop a frog into boiling water, it would do everything it can to escape as fast as it could. However, said these early results, if you put a frog in a pot of cold water, then ever so slowly increased the heat, the frog would take it in stride, and stoically endure until it dies. Of course, the earliest of these experiments involved frogs whose brains had been removed. A modern person of pointy-headed persuasion might ponder that and wonder how such treatment could be seen to determine normal frog reactions to anything. Clearly, the experiments predate current standards and norms for humane treatment of research animals. But quibbling over misbegotten methodology aside, repetition is key to scientific inquiry. The early boiled- versus slow-poached-frog hypothesis hasn’t withstood rigorous, recent testing. In fact, modern tests show that the hypothesis is all hooey. If you drop a frog (with its brain intact and unmeddled with) into boiling water—and shame on you if you do—the animal dies. Furthermore, if you gradually heat Kermit (with his brain intact and unmeddled with) in water, he will do what he can to escape—just as today’s fish seek out cooler, deeper pools of water in rivers. Nevertheless, the poached-frog myth is often trotted out to describe, among other things, the effects of steadily creeping standards and expectations on individuals and society. The current trend towards obesity and inactivity has created a new normal in Canadian society. As a population, we’re heavier than we were 25 years ago, and—for the most part—we accept our wider waistlines and our inability to climb a flight of stairs without panting. More accessible, portable technologies have increased the pace of communication and allowed work to invade our private lives. We’re now expected to be connected, available and ready to respond 24/7. As evidence of the new normal, if we set boundaries, we risk discipline or disapproval. Increased population growth and development has led to more traffic sharing road networks designed decades ago. Fifteen years ago, a 10-minute tie-up at the TransCanada Highway and McKenzie Avenue marked rush hour. Now, waits of just 30 minutes or more are expected. A decade ago, dud ski seasons were rare. Now, we wait until there’s enough snow before we book ski weeks up Island. Because change is the only constant, tomorrow’s new normals nip at the heels of today’s standards. We adjust our concept of what is “normal” continually and without much thought, and don’t even notice the shift until it is pointed out. With climate change models predicting longer, hotter, drier summers on the coast and with recent assessment of the accelerating rates of glacier melt, the conditions that lead to low and warmer rivers in southern B.C. may become another new normal. Will the slow-poached-frog metaphor become the future reality that our salmon face? A version of this editorial appears in the August 9, 2015, Victoria Times Colonist.